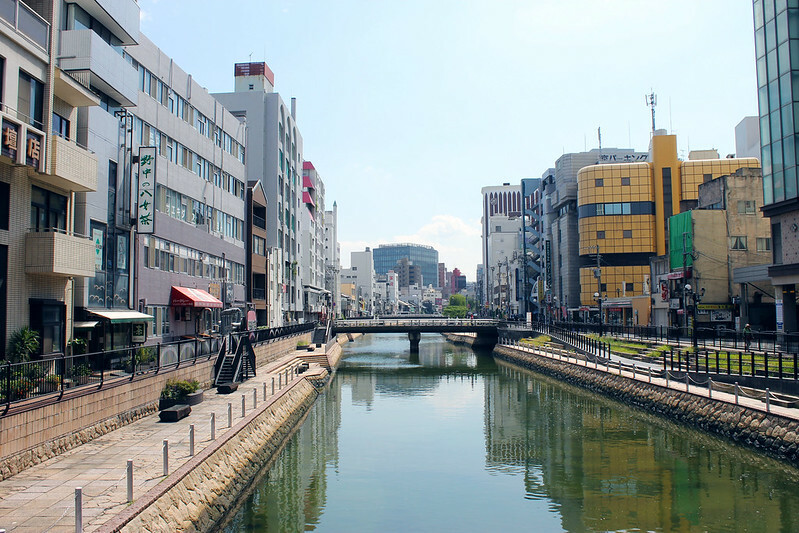 With a population of close to 1.5 million people, Fukuoka City is some 5 times larger than Saga City, making it not only the biggest city in Kyūshū but the 6th largest in the country. From Tosu it would take me just over an hour to reach downtown Fukuoka. The city’s streets were choked with traffic whilst its sidewalks took a pummelling from the hoards of shopaholics milling from one shopping mall to the next. I’d booked a night in a hostel close to the city centre and upon arrival found myself taking a little siesta. I’d hammered it from Nagasaki yesterday and the wear and tear on my body was more than evident as from the moment I lay my head down, I was out like a light. Awaking around dusk I put on my best soy sauce stained t-shirt and took a walk over to Nakasu Island. 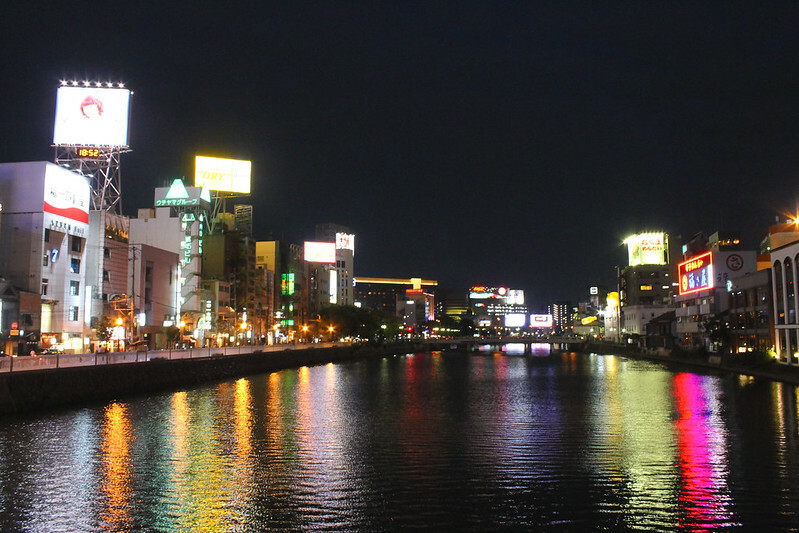 The inner city island surrounded by the Naka and Hakata Rivers is one of the busiest red light districts in Western Japan after Osaka. 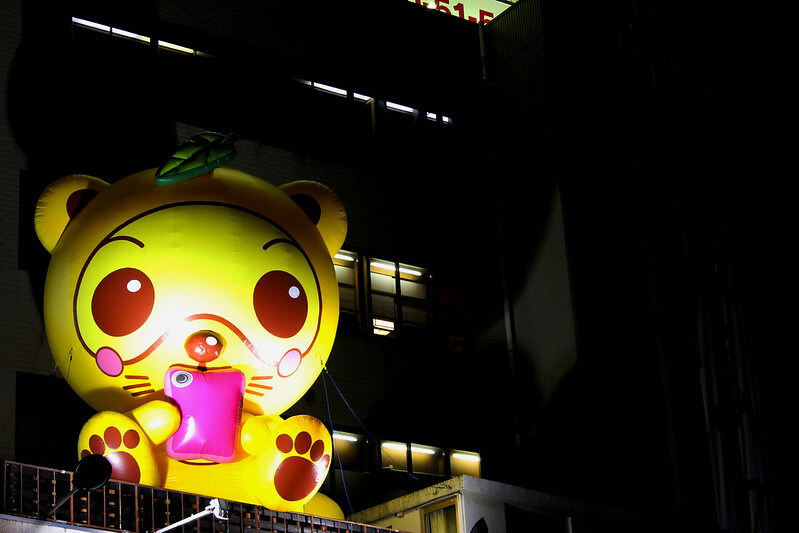 Huge neon billboards were perched atop a row of high-rise buildings advertising various alcoholic beverages, hostess clubs and love hotels. Yet on the deck I couldn’t see anything that resembled the seedy world of a red light district, just a few convenience stores, a Mister Donut and a couple of 100 Yen shops. All seemed very innocent and inoffensive. My main draw for being here however was not to experience an expensive and meaningless chat with an attractive Japanese girl, whilst she lights cigarettes that I don’t even know how to smoke properly, but more to sample one of Fukuoka’s yatai, an open air food stand. 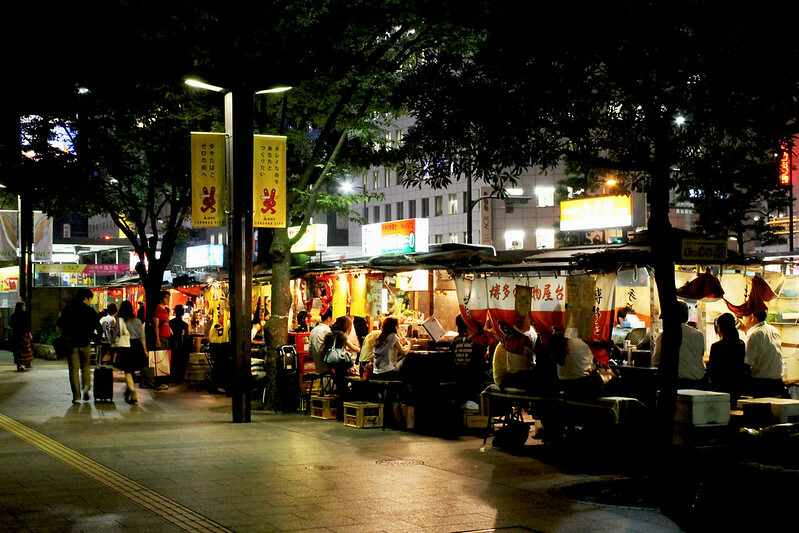 Across the city one might find some 150 yatai stands which generally sit around 6 to 8 people, and if you can find a seat, it’s yours. 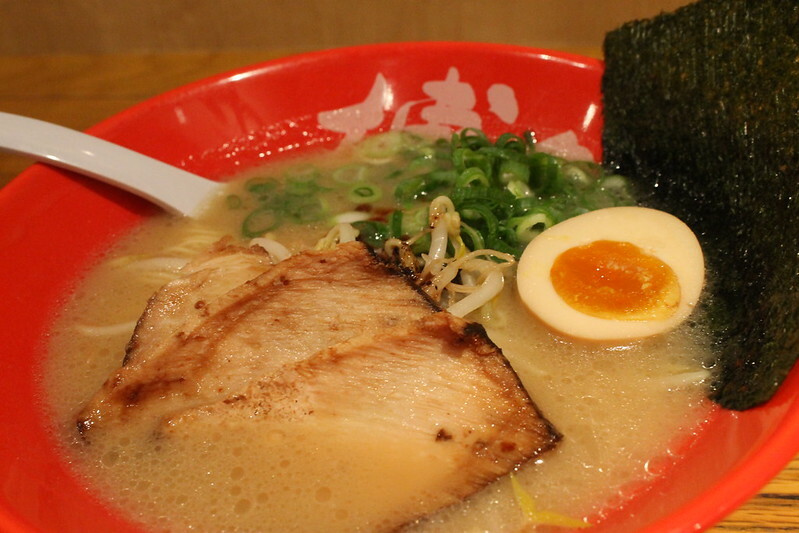 The air lingered richly with the fine smells of Japanese cuisine as I took a seat at one such stand and ordered some Hakata Ramen, one of the local favourites. Served with ultra-thin noodles it was a thick bleached white looking broth made from the boiling of pork bones, collagen and fat. It was scorching hot and would take me nearly 30 minutes to nurse, but it was delicious and made a welcome change from 7-Eleven noodles. I washed the ramen down with my first beer since Okinawa. Yes, yes, I know I said I was never going to drink again, but my strange heart palpitations had since ceased and so one could only assume that I was fixed and therefore ready to enter back into the sordid realms of the booze industry. 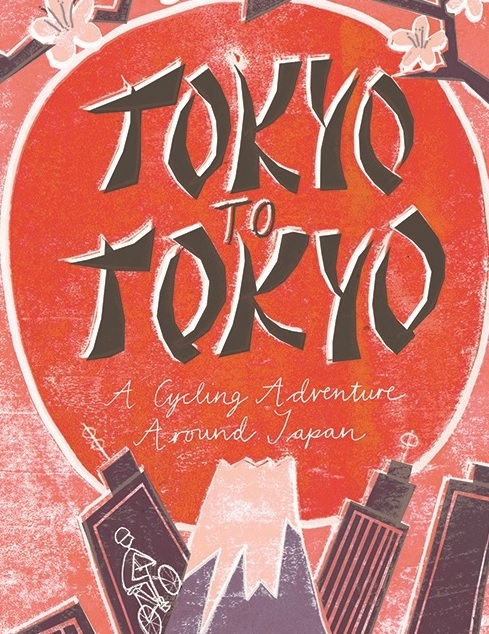 By the time I’d left the yatai stand it was gone 10pm, there were now reams of drunken salarymen parading up and down the banks of the river, one drunk was giving another a piggy back, whilst a colleague chased after them, kicking them both up the arse. Suddenly, the innocence of the pre-10pm watershed was lost. Scantily clad girls began to loiter the neighbourhood, many wielding signboards that detailed some information that I couldn’t understand along with how long one gets and how much money it will cost them. Many of the girls seemed upbeat putting on brave smiles as they screeched out their wares and invited passers-by into their clubs, others looked miserable as sin as their mind played on the night ahead. I watched one young girl lead a happy bunch of middle aged salarymen into a shady looking building, the men would enter happy and no doubt leave happy. Sadly, I felt the same perhaps couldn’t be said for the bulk of girls working in this industry. The thought depressed me a little and I called it a night.